My family is and was and will, I suppose, always be a Harry Potter family. My children grew up with Harry, Hermione and Ron and are virtually the same ages. We read the books together, impatiently awaiting the release of each new volume from J.K. Rowling. We watched the movies together although we would all agree that though the movies were pretty exciting, they never were nor was it possible for them to be as good as the books. Many years ago, when the Harry Potter series was being released, the choice of Harry Potter mugs that I encountered was quite limited and not particularly appealing, despite our affinity for the boy wizard and his world. If I was going to buy a Harry Potter mug, I wanted it to be really nice. However, that is certainly not the case now. The choice is endless and some mugs are pretty darn handsome so it was a difficult quest that I set out upon to find one, stand-out mug to feature on this post. I love the Wizarding World of Harry Potter Marauder's Map mug. However, it really is a giant mug that is, in my opinion, much to big to be used on a daily basis. If you are curious about it, you can learn more about it on my page devoted to Marauder's Map gift ideas by clicking here. I finally settled on a series of Harry Potter mugs from Filch's shop at the Wizarding World of Harry Potter, as shown above. I chose them because they are handsome and because it is possible to own a set of four similar but not identical mugs though you will have to assemble your set by buying them individually. They represent the four houses of Hogwarts School of Witchcraft and Wizardry: Hufflepuff, Ravenclaw, Gryffindor and Slytherin. Although they are from the Wizarding World, they are readily available online and you can currently find all four of these Harry Potter House mugs on Amazon by clicking right here. If you want a Harry Potter mug but not these particular ones, I recommend looking on eBay rather than Amazon. At this point, eBay has a much wider variety of nice Harry Potter mugs and, as the manufacturers stop making them, I would expect eBay to be increasingly the better source for out-of-production Harry Potter items. 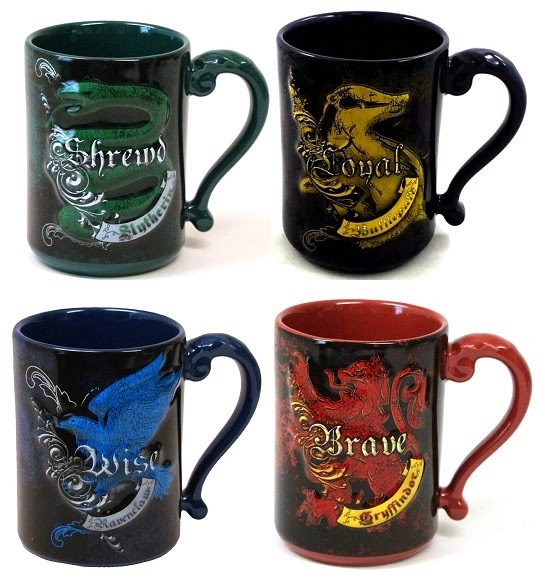 You can easily check eBay's selection of Harry Potter mugs here. I Might Have in Store for You! P.S. If you'd like to see all of the mugs featured in my series 31 Days of Coffee Mugs, you can click on the tab at the top of this page.